Eric Giles works from the crow’s nest of his Marsh Master wetland buggy at heights of up to 20 feet off the ground. 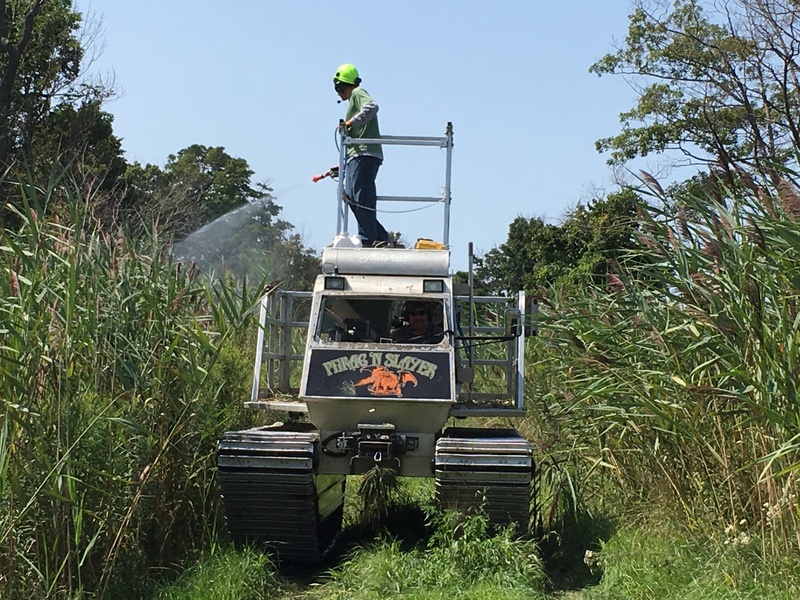 He needs the elevation to reach the top of invasive Phragmites plants. His driver below can’t see a thing. “We have to wear headsets to communicate, so I can tell him where to drive,” says Giles. Giles is spraying herbicide at a southern Ontario wetland. It’s part of a pilot program to control invasive Phragmites (Phragmites australis) at Long Point and Rondeau Park. His machine, sporting a “Phrag’n Slayer” logo, is one of the few things that can get through the thick mass of plants—which he’s seen grow up to 22 feet tall. Eric Giles stands in a wetland overtaken by invasive Phragmites, next to a path cleared by his Marsh Master buggy. Invasive Phragmites is an aggressive, alien plant species that grows much larger than its native counterpart. It chokes out other plants and the wetland ecosystems that support wildlife. 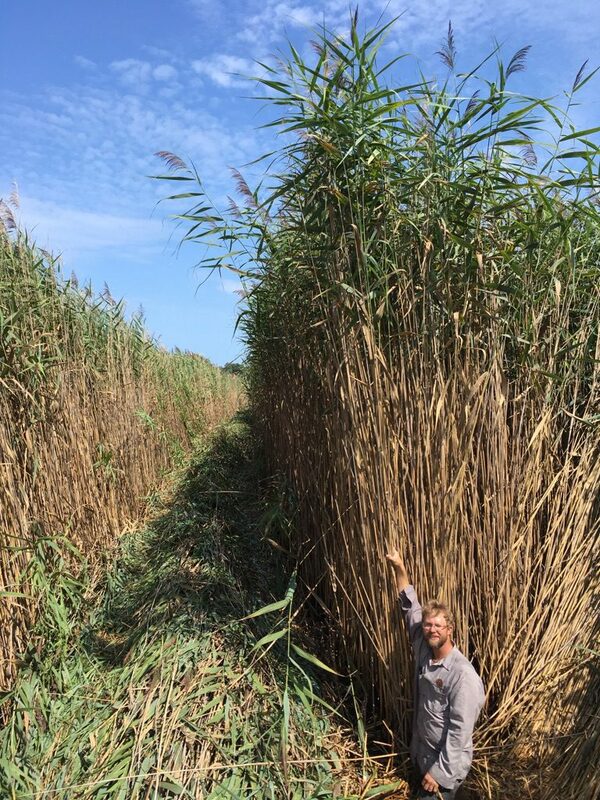 “Invasive Phragmites outcompetes most native vegetation and forms dense colonies, not allowing anything else to grow,” says Erling Armson, DUC’s head of land securement, invasive and northern programs. In 2005, scientists at Agriculture and Agri-Food Canada recognized invasive Phragmites as the country’s worst invasive plant. It is well established in southwestern Ontario and eastern Ontario near the Quebec border. It is also spreading into northern Ontario’s boreal region. Under the right conditions, it can spread up to 30 per cent per year. There’s no easy solution for Ontario’s invasive Phragmites problem. But a multi-faceted strategy is gaining ground, thanks to extensive research and partnership efforts. At Long Point and Rondeau Provincial Park, DUC mapped the plant and teamed up with the Ministry of Natural Resources and Forestry, Nature Conservancy of Canada and special interest groups. Together they created the herbicide pilot program and obtained an Emergency Use Registration permit to fight back large stands of Phragmites. More than 3,700 acres (1,500 hectares) have been safely treated this way so far. In the winter months, the dead Phragmites are rolled and/or cut. Some areas may also be burned. This allows the native wetland plants to regenerate more easily, and helps the wetland return to a more diverse and healthy ecosystem. According to Armson, the strategy is working. “An intensive monitoring and evaluation component—led by the University of Waterloo—clearly shows that the herbicide has been effective at killing Phragmites without any significant impacts on water quality or other wildlife,” says Armson. A helicopter is used to spray invasive Phragmites in open areas. Early battles may be won at Long Point and Rondeau Park, but Ontario isn’t the only place where invasive Phragmites has crept in. It’s now been reported in all three Prairie Provinces. For now, researchers like Wrubleski are observing the plant and its locations in the West. If a battle must be waged against invasive Phragmites on the Prairies, it can be informed by the successful strategies developed in Ontario.